Do you use proofs in your client meetings or presentations? We now take our services one step further by offering mounting to foam core designed specifically for presentations. Nothing looks quite as nice as a color accurate proof that is not only vibrant in color, but also mounted and trimmed by hand to give your proof that polished and professional look. We hope this service will help our clients impress at their next creative meeting. 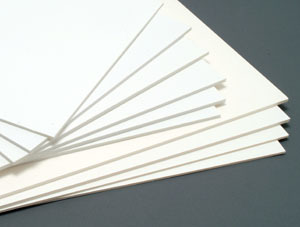 We offer mounting onto industry standard 3/8" white foam core. Because mounting in itself is an art, we have partnered with a veteran here in New York City. 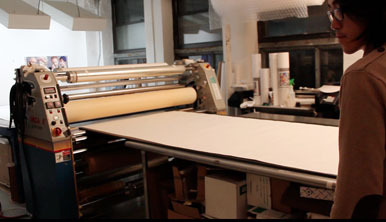 Dennis Hardeen boasts 40 years of experience in mounting and lamination. In addition to adding a seasoned operator to guide us in our production, we have added some of the best in cold mounting technology with the Orca 2, capable of mounting onto any substrate up to 1/2" thick. We also offer specialty mounting to other substrates such as Ultra board, Cintra, and DiBond. For specialty mounting please call us for a quote at 212-529-7885.